Biloxi Bay is home to many of our rich histories even as early as the late 1600s. There’s Biloxi, of course, and a couple miles east sits Ocean Springs, “The City of Discovery,” and Pascagoula and west there’s Gulfport. Although a relatively small area, it holds a plethora of records; probably more records than a researcher has time to scour in one visit, especially sine they are scattered throughout the region. When taking genealogy trips, I usually do all the legwork at home. Why waste precious time? Here are a few pointers: Let’s say we want to concentrate on deeds and wills in Jackson County, Mississippi, the home of Ocean Springs and Pascagoula. We need to know the record keeping history of Jackson County, Mississippi. We learn immediately that the courthouse was plagued with fires, four of them, the latest being 1875. That is not good news, but let’s not despair! 1) First check the Family History Library (FHL) Catalog, to learn what is on “loan-able” microfilm. Never waste time on a genealogy trip staring into a microfilm screen when you can do that for a month at a time at your neighborhood Family History Center, an approved genealogy library or a State Archive for only $5.50. The only catch is that it may take a couple of weeks to receive the microfilms. Remember, you can only borrow microfilms not books, so take note of the Format entry in the catalog. For our region, the FHL has land and property records, between 1854-1924. But, it also has indexes between 1888-1893, and 1895-1896. So if you are looking for records prior to 1854, an onsite visit to the Biloxi Bay area may be your best bet. As far as indexes are concern, no need in ordering those if you are already going to visit. The court ledgers should have an alphabetical index in the front of the book, or some form of cross-reference. If you are doing slave research, be sure to research the slave master’s records. You may find your ancestor listed in inventory lists, wills, deeds, etc. Slaves were not only sold, but hired and shared between settlers. They were also considered inherited property, so don’t forget the records of the offspring’s of the slave master. Slaves may also have named their previous slave master in a law suit, usually after the civil war and only for character building, but not so common in Mississippi. 2) My next stop is always to the local Genealogical Society website. Why? Sometimes, they guide me directly to the repositories I need. Keeping the theme of Jackson County, Mississippi why not try the Ocean Springs Genealogical Society website. Here you can go to “Research Links” and identify microfilms that the FHL does not have; such as the Wills for 1876-1925; and Deeds from 1879-1888. Although I’m still not impressed, since Ocean Springs was settled around 1699 and incorporated in 1892, I take note. The most thrilling of all of this is the tax rolls of 1819-1846. By analyzing tax rolls, I can often find out quite a bit about my ancestor: who were the neighbors, did they own land, etc. However, if you are doing slave research, these records are usually of no value to you. But be sure to become familiar with the tax rolls. A curious point - the Jackson County marriages are divided as Marriages 1837-1919 and Marriages-White 1875-1883. Perhaps free-coloreds and ex slaves after 1864 are listed here. Worth looking in the index for a name. 3) As I mentioned before, I’m still not impressed, so where else to spend those few days while in Jackson County, Mississippi? Why not visit the Mississippi Department of Archives and History (MDAH). website. I’m an advocate that you become familiar with the website catalog reviewing County and District digital holdings, as well as online collections, prior to your local visit. Keeping our example of Jackson County, Mississippi, I tested the Online Catalog, “County Records on Microfilm.” and found once again that most everything – deed books, estate records, etc. - has only been preserved from 1872. This is not unusual, as the state archives’ holdings are only copies of what is held in the local jurisdictions, but in this case it does not appear that there have been any efforts to reconstruct records. A Bit of Local Geography - Based on a quick reading, it appears Mississippi became a state in 1817, and the major mode of transportation was via water. There are groupings of holdings at the Mississippi Department of Archives and History cataloged as the Biloxi District and the Gulfport District. Although the Biloxi District Court and Will records begin in 1868 (pretty late), the Gulfport District dates back to 1841. 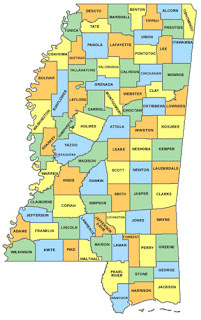 Yes, I know the Gulfport District is in Harrison County, but it is adjacent to Jackson County. So, now the questions are how and when did the county lines historically change? A little more research is needed here, so why not check a State Formation Map? Jackson County was established in 1812, but in 1841 the western part became Harrison County. Historical Newspapers - Although I wouldn’t spend too much time searching old newspapers on microfilms, especially if they can be ordered from the state archives or through the FHL and reviewed at your home location, I would recommend you become aware of the politics and newspapers of the time. The MDAH has a comprehensive holding of Historical Newspapers. Note to African American researchers, you may wish to go through church newspapers such as the Star of Zion, AME Zion. Check for a local African American History Museum. Public Libraries - Remember to go to the public library in town, which may have a collection of local historical papers or books. Usually you can get assistance by calling the research librarians in advance. For African American researchers check for any Republican biased papers before 1900, they were more sympathetic to African American news. University Collections - One last pointer: don’t forget the local university holdings. They are unused goldmines. Again, in this region, I would suggest African American researchers to be mindful of the local Historical Black Colleges and Universities (HBCU), even if they are located a few hours away. Call in advance and become familiar with their holdings for your specific interest.